The Bashi Channel is seldom discussed, but bears great strategic relevance for the People’s Liberation Army. China’s air force held exercises on Monday in the Bashi Channel, the waterway connecting the South China Sea with the western Pacific Ocean, between Taiwan and the Philippines’ northernmost island of Luzon. Chinese People’s Liberation Army-Air Force (PLAAF) “bombers, fighters, and early warning and aerial refueling aircraft” flew through the channel on Monday, according to a Reuters report, citing a post on the PLAAF’s official microblog account. “This move is to raise the air force’s abilities via training, to meet the needs to maintaining national sovereignty, protecting national security and guaranteeing peaceful development,” the PLAAF noted in a statement posted online, translated by Reuters. “This is common practice for the air forces of littoral states, and a normal need for China national defense and military building,” it added. Chinese exercises in the Bashi Channel appear to be turning into a regular occurrence. As I discussed last year, the PLAAF held its first exercise in the airspace over the channel. 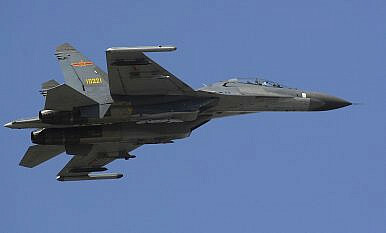 Colonel Shen Jinke, a PLAAF spokesperson, said at the time, that “Training in the airspace far from China is an effective way for the PLA Air Force to temper its combat capability and also a common practice of world powers’ air forces.” As I’d explained at the time, the PLAAF’s growing interest in the Bashi Channel is evidence of the Chinese armed forces’ increased focus on far sea and expeditionary operations. The Bashi Channel in particular is a strategically pivotal waterway, marking the rim of what Asian security analysts call the first island chain–the chain of major archipelagos running down the eastern Asian frontier, beginning with the Kuril Islands off the coast of Hokkaido in Japan all the way south to the Philippines and Borneo. The channel’s proximity to both the disputed waters of the East and South China Seas, as well as Taiwan and the Philippines, means that Beijing has a strong interest in ensuring that its military is comfortable operating in the area. A conflict with Taiwan remains at the top of Chinese strategic planning and, while Beijing’s offensive would mostly play out across the Taiwan Strait, securing the Bashi Channel would be critical to denying intervention by third parties, including U.S. forces based in the Philippines. For China, familiarizing its military with operations both along and beyond the first island chain are an increasing strategic priority. The first island chain’s importance in the People’s Liberation Army’s strategic thinking grew starting in the 1980s, under the strategic tutelage of former PLA Navy commander and Central Military Commission Vice Chairman Liu Huaqing. Unsurprisingly, the PLAN has taken the lead in the Bashi Channel. Last year, in July, the PLAN held a major drill in the area, simulating real combat conditions. “Going forward, similar drills and exercises will keep taking place,” noted Liang Yang, a spokesperson for the PLAN, at the time. The Bashi Channel additionally bears relevance for the PLAN in China’s ongoing dispute with Japan in the East China Sea. In April 2013, a Chinese Type 054A frigate and Type 052C destroyer transited the Bashi Channel after returning from a deployment to the Philippine Sea. That transit came during a time of particularly heightened tensions between China and Japan over the disputed Senkaku/Diaoyu Islands in the East China Sea. Accordingly, the two vessels traveled north and transited the Miyako Channel westward, near the disputed islands.